The industrial revolution turned Germany into the third largest industrial nation in the world. And in Suhl the craftsman’s workshops turned into manufactories and later into gun factories. The Merkel brothers wanted to be a part of the unprecedented transformation of the national economy at the turn of the 19th Century. Albert Oskar, Gebhard and Karl Paul Merkel came from a long line of engravers, stock makers and gunsmiths – and a family with many children. All eleven sons of the family found their way into the gunmaking trade. 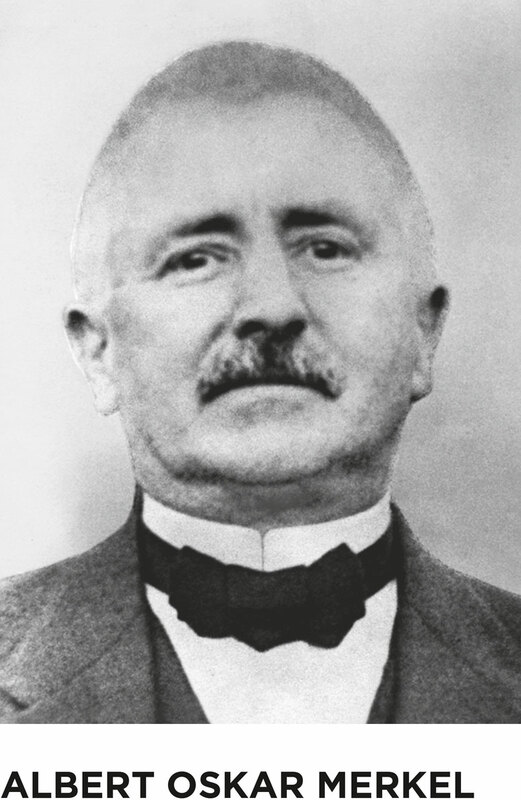 Albert Oskar and Gebhard Merkel were master gunsmiths. 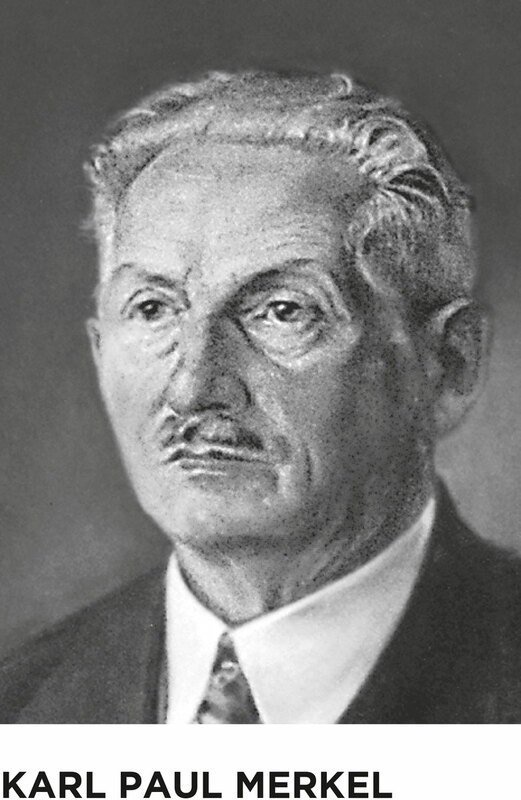 Karl Paul Merkel followed as a master stock maker – they formed a trading company “for the purpose of the joint manufacture of firearms and other articles. ” On the 1st September 1898 the company started running in the second district. This was the start of a development that is remarkable even in the gunmaking town of Suhl. During the formative years of the company the manufacture of hunting, sporting and luxury guns was booming in the old gunmaking town. The mechanical design of these guns was more elaborate and technically variable than military rifles. Merkel was committed to the “fine gun” at all times; even in wartime it was never more than a parts supplier for military production. While the two great wars of the 20th Century turned some gunmakers into industrial enterprises, the Merkel workforce hardly ever rose above 350 employees during the war. Instead, the export-oriented company twice lost its important foreign markets. From the beginning onwards, the Merkels pinned their hopes on innovation. 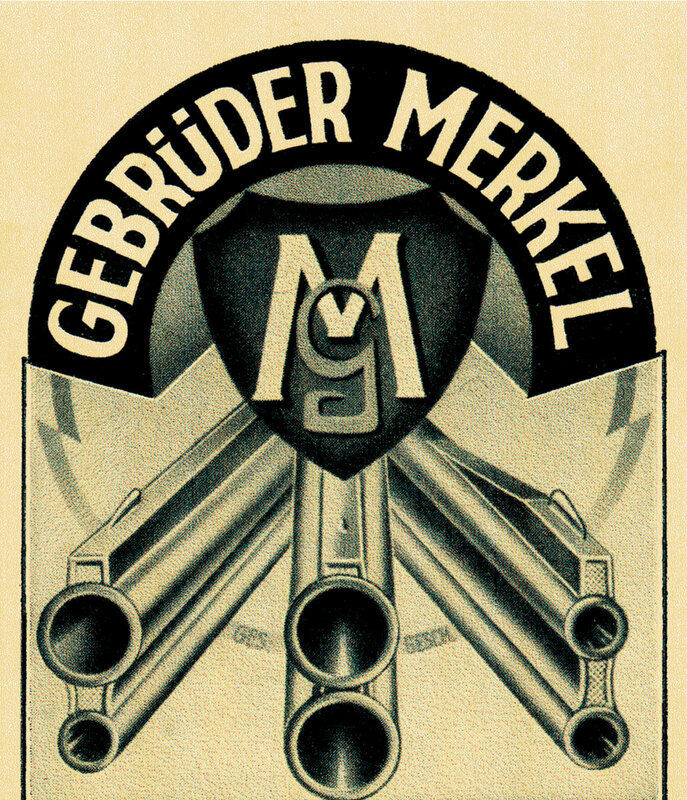 The over-and-under gun with two barrels lying upon one another originates from Suhl, and Merkel registered the “Bock” as a trademark. Merkel revolutionised sport shooting and hunting with these rifles. The workshop-diaries show, like almost no other document of the formative years, the work and ideas of the Merkel brothers. The great gunsmith meticulously lists the production, problems and solutions of day to day working. The genius trick of Gebhard Merkel: He uses stamp ink on barrels, springs and lock parts to transfer their pattern into the book. 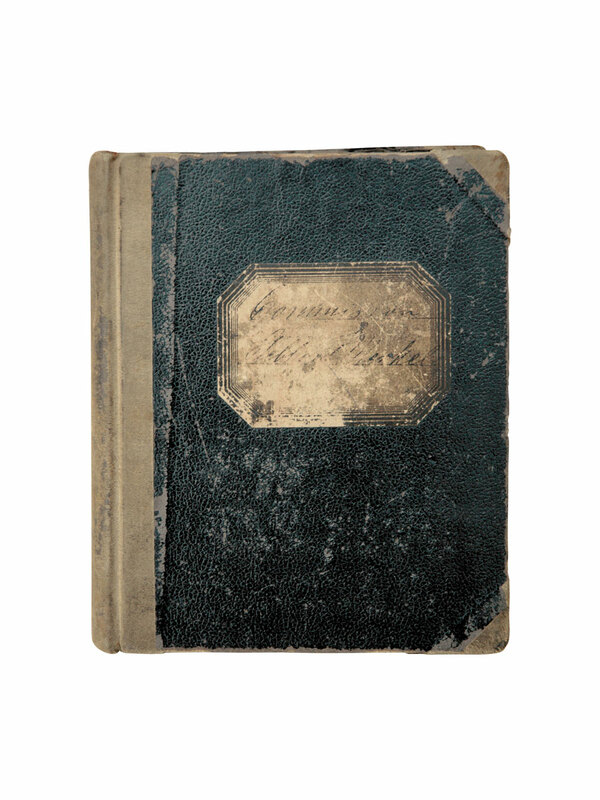 The workshop diaries are in possession of the descendants of the Merkel brothers – we are thankful for the granting of facsimiles. The archive of the Merkel manufacture houses gun manufacture cards from eleven decades – they are the birth certificates of our handmade guns. In detail the type, calibre, steels, stocks, variants, mounts and engravings are described on them – the document also acts as a certificate of the original state for later servicing of the gun. 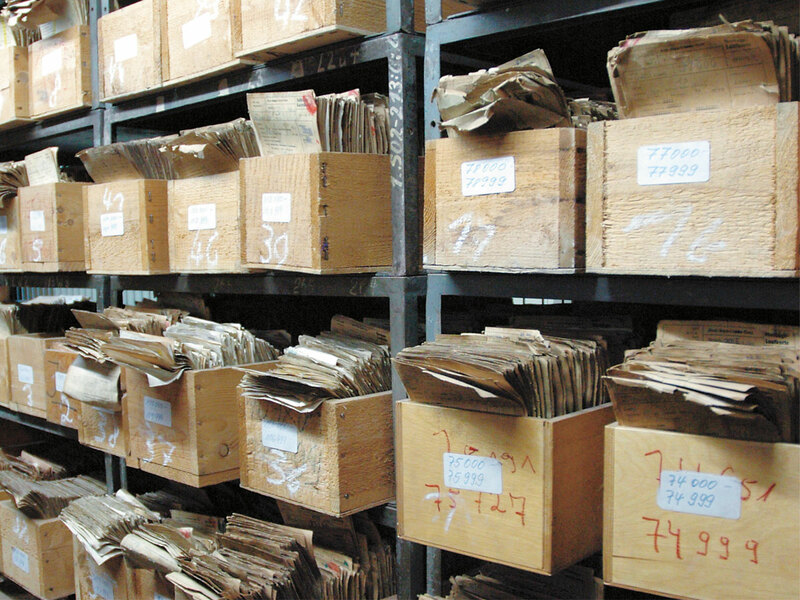 A lot of these documents were lost after the war and the turmoil of the German reunification. The new gun museum in Suhl documents the past and the present of the city – as a chronicler and keeper of a rich tradition of the Suhl weapon smiths since 1535. Merkel is the last of the large scale hunting rifle manufacturers in Suhl. 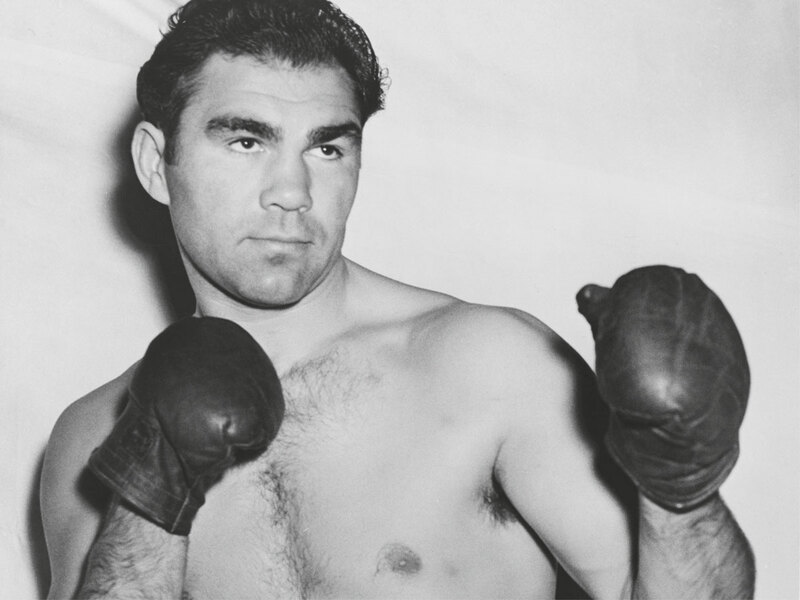 For the reopening of the Museum, Merkel expressed their congratulations with a very special present: The Merkel Company handed over the original gun card of the legendary boxing world champion Max Schmeling from 1936 to the museum. The great left punch used a Merkel O/U double rifle 321E with a custom stock and ejectors for hunting. Before the start of Second World War the company ran its own sales offices in many countries around the world. Merkel’s sales network spread from Argentina to Bessarabia to France, Greece, Norway, Romania, Spain and the USA. Again, this network was broken up by the Second World War. Hunting guns played a subordinate role in the war production from 1939. Merkel became a parts supplier for carburettor engines, carbines and rangefinders – and the number of employees rose to 350 in peak periods. 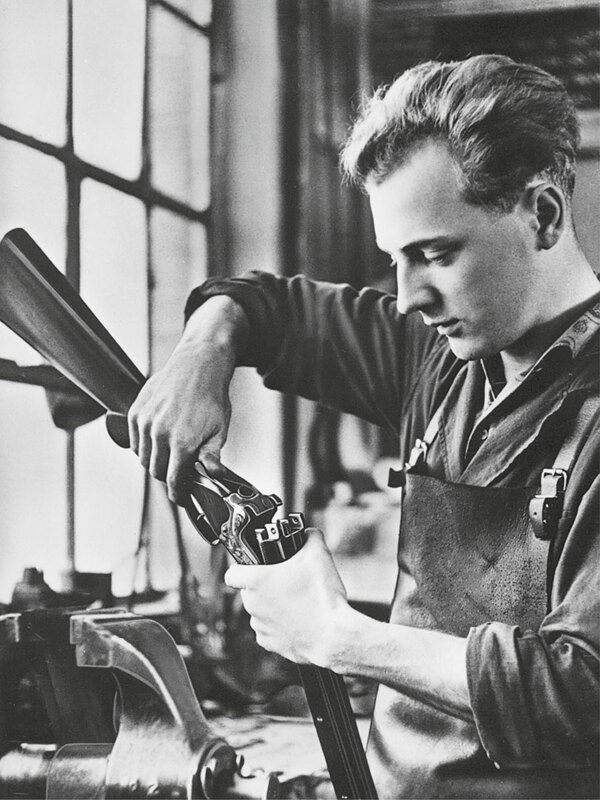 Even in the anti-training atmosphere of wartime Germany, the Merkel Company took the initiative to restructure the job specifications around the gunmaking trades, thereby ensuring the continuation of handcrafted gunmaking. The war ended in Suhl on 3 April 1945 at 8.30 in the morning – of all the factories in the city, only Merkel was to escape dismantlement. 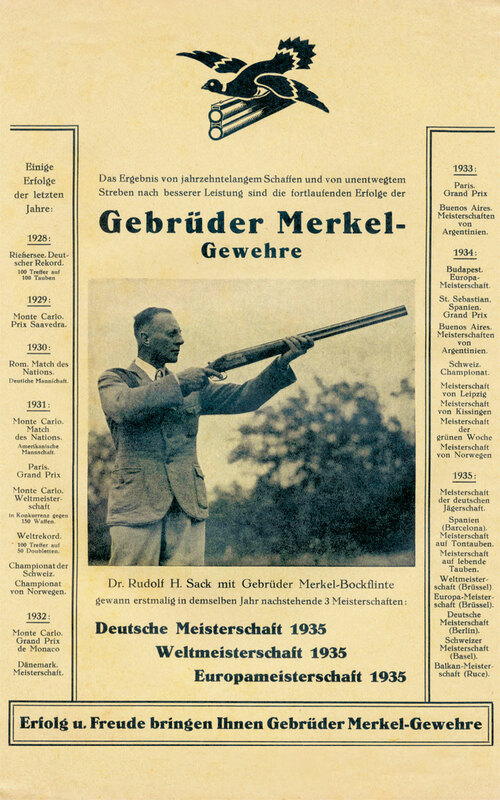 The good reputation of the precious hunting guns spared Merkel this fate – The Suhlers and their machine workshop, which was hi-tech at the time, stayed unified. By the end of 1945 hunting guns were already being manufactured again; by 1947 almost 700 rifles had been sent to Eastern Europe as reparation payments. Merkel developed into a showcase company of the German Democratic Republic. The dispossession of the founding families followed in 1948 – under disastrous conditions, the descendants of the Merkels lost everything to socialism; everything the brothers had built up and the second generation had enlarged. 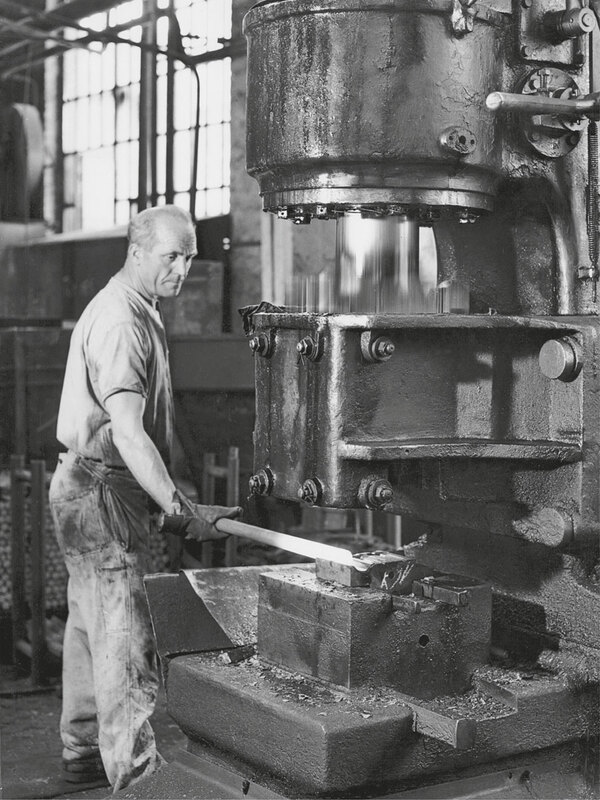 In 1952 the state-owned company again had 200 employees manufacturing hunting guns. The company was integrated into a state combine, but the brand and the products remained independent. In 1953 the GDR government presented Merkel hunting rifles to the two most powerful men at that time, Dwight D. Eisenhower and Nikita S. Chruschtschow. And in 1963 the first man in space, the cosmonaut Juri Gagarin, was honoured with a Merkel Drilling. The socialist workers’ and farmers‘ state cultivated its export hit. In the 1970s a range of luxury guns was developed and sold around the world. The gun card archives include the names of illustrious personalities such as Gamal Abdel Nasser, Josip Brosz Tito and Mao Tse Tung. 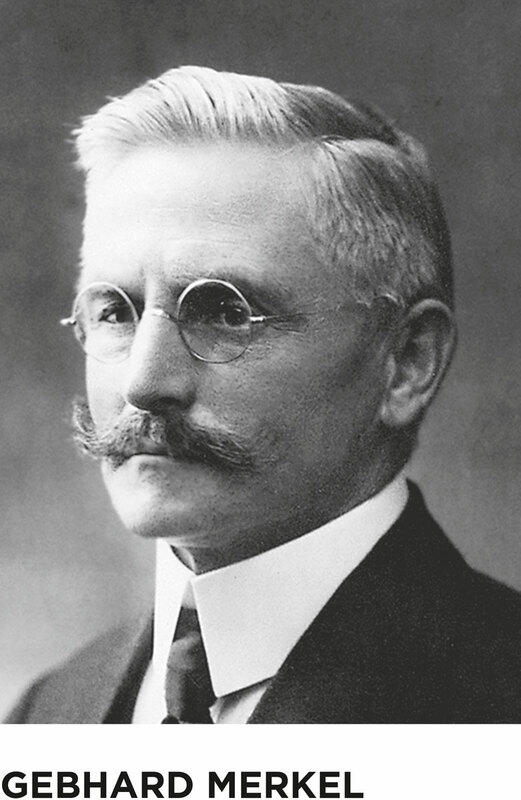 Even Franz Josef Strauß, the Bavarian Minister President and enthusiastic hunter, ordered his rifles from Suhl. Between 1945 and 1987, production of Merkel over-and-under guns alone reached 150,000. The GDR celebrated the success of Merkel rifles with a set of special postage stamps. With hunting and sporting gun production flourishing after the war, Suhl became an important sports shooting centre. 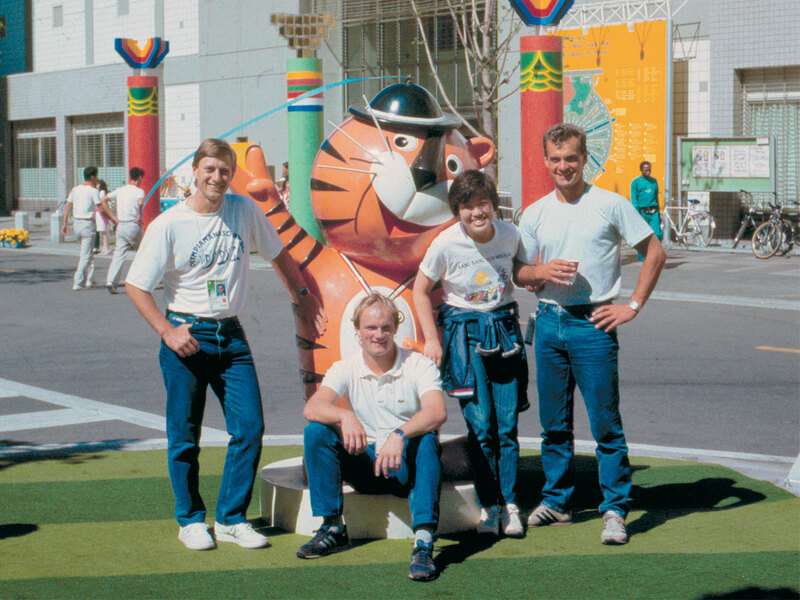 Around 100,000 visitors came to Thuringia for the world championships in 1986. For a few days, the city with a long tradition of making firearms was the undisputed centre of world shooting sports. In his enthusiasm for the Merkel product range, the Mexican president of the International Shooting Sport Federation, Olegario Vázquez Raña, proclaimed: “I think these are the most perfect hunting rifles in the world. 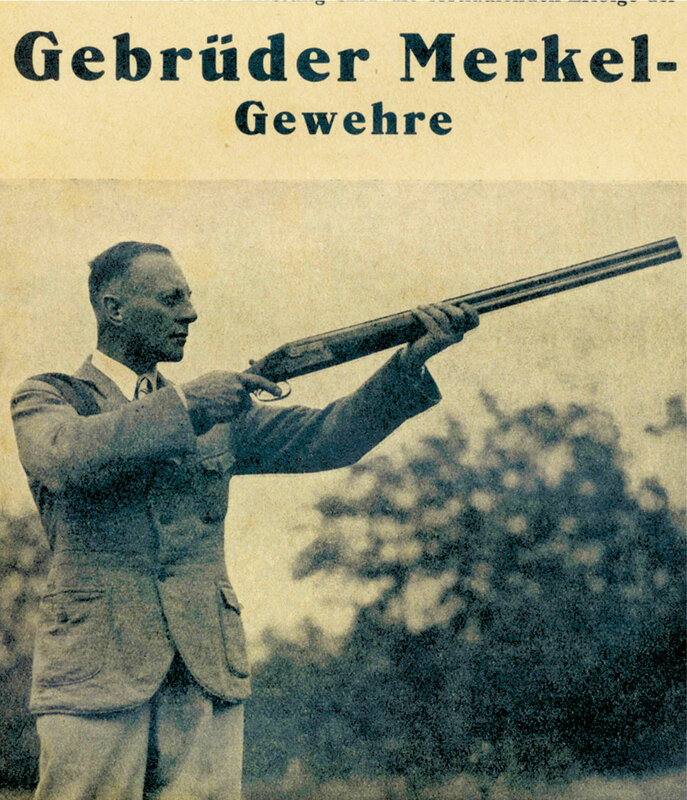 ” He thought the Merkel over-and-under shotgun to be, “the queen of hunting rifles“. And he should know – not only did Vázquez Raña hold the highest sports shooting office in the world, he was also world famous as a practicing trick shot artist. 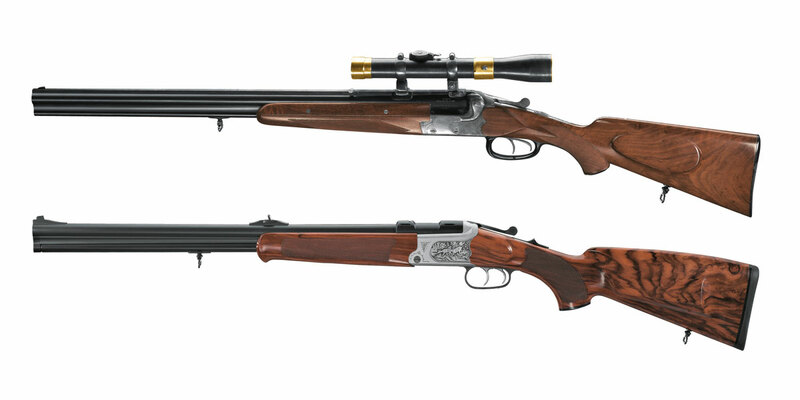 Between 1954 and 1989 sporting shooters won 45 titles at world and European championships, using Merkel rifles. In 1989 the German Democratic Republic came to end – the revolution came from the bottom. It was unprecedented in its courageousness and its bloodlessness. With the slogan “We are the people”, the people of the GDR freed themselves from the ruling powers. Reunification was accompanied by considerable turmoil – many jobs were lost in Suhl. Nevertheless, the Suhl combine remained the largest producer of hunting guns in Europe. This is where the sought-after Merkel rifles are manufactured – however, they were still at the technical level of the 1950s. Uncertain ownership status accompanied Merkel to the end of the millennium – then the traditional brand got on its feet again. Investors provided the backing, which laid the foundations for new products and the continuation of the Suhl gunmaking tradition. At the time of the change it became apparent that there would be no future, without maintaining the values of the past. Industrial precision cannot exist without handcraft skills. Merkel always was and still is a major promoter of the different professions of the gunmaking art – because the company knows, needs and fosters its roots and skills. Merkel is very aware of the heritage of Suhl gunmaking. The last great manufacturer of the old gunmaking town still sees itself as a manufactory in the image of the Merkel brothers. The Merkels were children of the Industrial Revolution – and understood how to adapt to these enormous leaps in technology. Despite the machinery, which was hi-tech at the time, they preserved the individual and handcrafted character of their rifles. As early as the mid-1990s, the complete range of Merkel hunting guns underwent careful reengineering. Where technical advancement increased the safety of the shooter, it was used. Where state of- the-art technology improved the precision and prolonged the service life of a rifle, it was applied. The visual appearance of a Merkel 303 made in 1924 differs only in details from a modern 303 over-and-under shotgun. And in 1924, as in today’s time, these wonderful hunting guns were at the cutting edge of gun technology. From the outset the Merkel brand was characterised by the work of specially trained craftsmen; by employees who know how to make a gunlock with only simple tools and without machines. And this, even though they know how to handle computer-controlled machines and the most up-to-date surface finishing systems. Technology from tradition. Merkel‘s only production site is in Suhl – we see the location as a guarantee of quality that is recognised in many countries around the world. The Suhl manufactory is an exceptional combination of hunting gun manufacturing and high-tech forging. Merkel combines the traditional manufacturing methods of handcrafted hunting guns with the highest standards of quality and safety – all achieved in what is, for this day and age, an unusually deep in-house range of manufacture, from cold forged barrels to hand engraving. 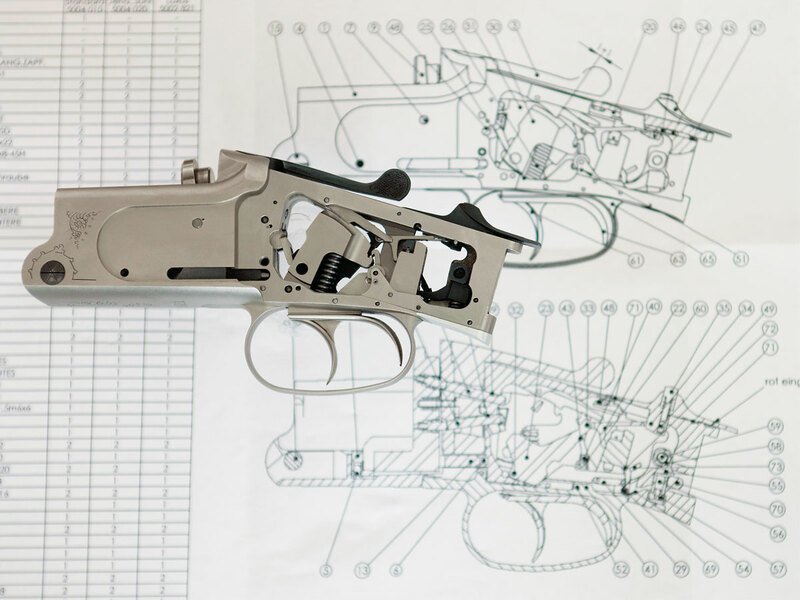 With every part of a Merkel gun, careful consideration is given to whether, from the customer’s point of view, it should be handmade or machine produced. Today Merkel exports into more than 40 countries all over the world and has more than 120 employees – each one a highly qualified specialist. They often come from families that have worked in the gunmaking trade for generations. They bring to us the manufacturing skills and expertise to find unusual solutions. Merkel employees define themselves and their work on the basis of the long tradition of Suhl gunsmithing. Merkel Top-Down: Merkel guns offer the customer the power reserves of the unique Merkel top-down principle. This means that the highest calibre of every gun class defines the breech of all the underlying versions. The breech of the Africa side-by-side rifle thus sets the standard for all the other side-by-side guns. Steel on steel: With Merkel locking mechanisms, the principle applies that steel is always locked on steel. 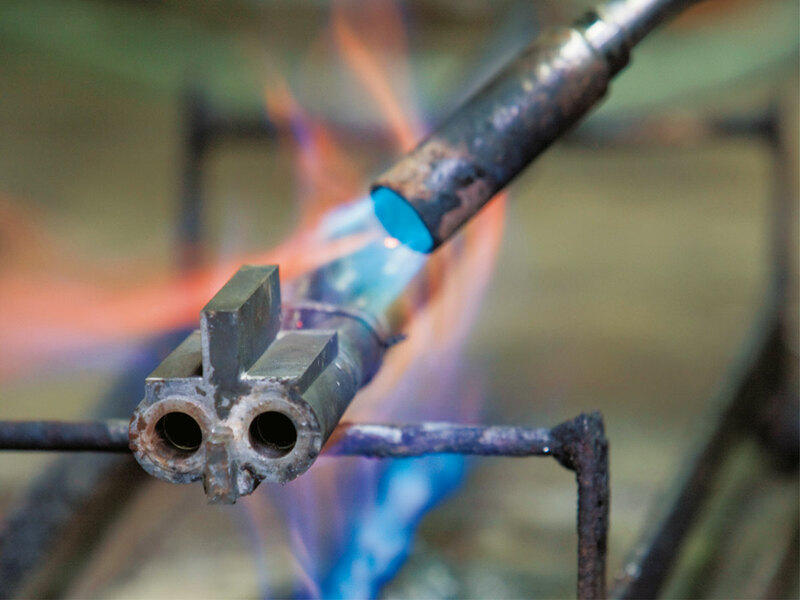 Handed-down quality: We have mastered the traditional manufacturing methods, which still, produce unequalled quality – we hand them down and develop them further. For example, we continue to practice the time-consuming process of brush oxidisation because it provides extra quality for our customers.